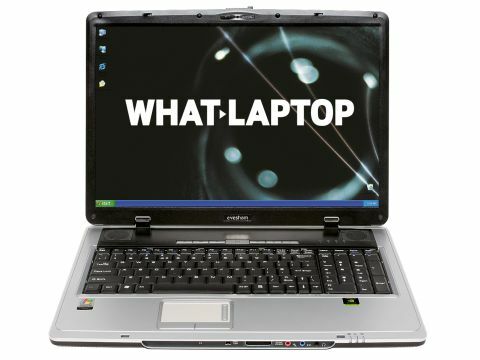 A company that builds laptops to order, Evesham can provide a machine to suit your needs at an affordable price. The Quest A430 Plus (£899 inc. VAT) is a useful 17-inch multimedia system. The display features a Super-TFT coating which improves contrast and produces vibrant results. The resolution of 1680 x 1050 pixels is above average, and enables images to appear sharp. This creates more room on screen for working with multiple windows. However, you will find that images and text are also smaller, so you may need to enlarge pages to make them easier to view. For those requiring strong 3D performance, an Nvidia GeForce Go 7600 graphics card is fitted. A mainstream GPU, this gives enough performance for playing the latest games, and will cope with other multimedia applications with ease. The 17-inch screen creates ample-sized palm rests that are comfortable when typing. The A430 features a dedicated numeric keypad, which is a mixed blessing. Although it lets you enter numbers considerably quicker, it means some of the secondary keys on the main keyboard have been reduced in size to accommodate it. The small enter and shift keys make typing problematic. The Quest is a reasonable rarity in that it doesn't use an Intel processor. Instead, you'll find AMD's Turion 64 X2 TL-56. With a clock speed of 1.8GHz, it gives the Evesham a similar level of performance to its Intel-powered rivals, in theory. In reality, the Evesham struggled. Despite the AMD processor being dual-core, the A430 was disappointingly slow when it came to multi-tasking, with noticeable lag when running multiple applications. The battery life is also poor - an average of just over two hours between charges restricts use if you do decide to take it on the road. Build quality is good, with a strong chassis. There is no sign of movement from the large display when typing, and all of the buttons are firmly attached. When it comes to features, the A430 excels for its price. A multi-format DVD rewriter lets you copy files to DVD and CD, and if the 17-inch screen isn't big enough for you, a DVI port lets you connect digitally to external displays. There's a 1.3-megapixel webcam for video calls, and BullGuard Antivirus software is included. An 802.11b/g Wi-fi adapter allows you to connect to wireless networks. Although blighted by poor everyday performance, it's difficult to ignore just how much you can get for your money with the Evesham.